Little Rock Talking to someone yesterday who wanted to do a series of reports for KABF community radio about religion, caught me up short and forced me to actually think for a minute about the strange and interesting stirrings within religious denominations that might just indicate that in the face of declining membership, some of them may be moving towards peace with their parishioners rather than standing simply as a rock in raging rivers. The Boy Scouts announced that by a vote of 60-40, their advisory council had voted to accept gay scouts as a half-step towards equality in the scouting ranks. Earlier reports reminded everyone that religious denominations were the overwhelmingly numerous sponsors of scout troops with the Mormons, Baptists, and Catholics in the lead ranks. The Mormons, surprising many, had announced that they were encouraging their folks to vote for gay acceptance. It is impossible to believe that this measure would have passed without a lot of very conservative religious denominations joining ranks with the Mormons to meet the shifting views of the American public way more than halfway on this measure. Other reports have marveled at the critical role that evangelical churches are playing in pushing for immigration reform, once again surprising many observers who count such local churches as central to the social conservatism of many on these kinds of issues. This is actually not news, just something that it took a while for the mainstream to notice. Five years ago when I worked as a consultant to the National Immigration Forum and Casa de Maryland, it was common to see many evangelical leaders in the ranks and Rev. Slim Coleman from Chicago and others were untiring in their advocacy of progressive reform. Finally we even read that some priests and nuns are organizing as whistleblowers to stand finally with their parishioners in exposing abuse of children by priests. Certainly it is past time for an institution that has now been seen covering up such scandals all over the world, even while asking for institutional forgiveness. Nonetheless, hearing that some are breaking ranks finally is good news for the declining number of regular participants at mass. Organizations, even huge mass-based institutions like religious denominations, are still ruled by the organizational laws of man, even while they advocate the laws of their gods, and the law of organizations is that they either change or die. Maybe these are only small signs, but they are encouraging whiffs that the winds of change may finally be coming to American religions before their membership leaves them talking to themselves rather than counseling the people in the pews. Quito Nice to wake up and read the front page of the New York Times and see our companero/companera Carlos Saavedra from Peru and Boston and Gaby Pacheco from Ecuador and Miami, along with other young organizers and activists with United We Dream finally get the credit for their courage and skill in breaking through both the Congressional and professional nonprofit Beltway gridlock to force actions which have now given at least temporary relief for more than 300000 immigrants raised in the shadows of the United States after their parents arrival. We met with them at length in Washington last year and couldn’t have been more impressed. They are a case study in how to make change, despite the odds, by creating a narrative around injustice, building and holding onto a real base, and then creating tactics that are not artificial but real demonstrations of anger, courage, and resolve. We are all so close to seeing real change for so many of these young people, and hopefully many of their families, that even though it is still too early to celebrate victory, it felt great to finally see them get a small measure of the huge credit they deserve. Viva! Se si puede! Speaking of Ecuador, it was exciting to start training our first thirteen organizers preparing to go puerta a puerta or door-to-door to begin building a base in the barrios of Quito as part of our partnership between ACORN International and Ruptura25, an emerging progressive political party in the country. It was great to see the organizers point out on the large map of Quito, where they lived, as they introduced themselves to each other. 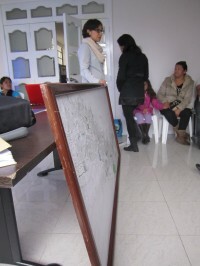 It was also fascinating to listen to them when we got them talking about local issues in their own barrios. There was excitement talking about the corruption of local officials, unremediated by the national law enforcement apparatus, and having to pay bribes to place their children in public schools, get accepted for public day care, and even see their fathers pay to get professional jobs with contributions to politicians and parties. 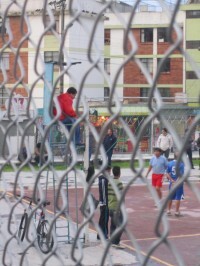 While scouting turf in various barrios in Quito Norte, I got to see and enjoy a unique scene: Ecuadorian Volleyball, or as our companera, Valentina Ramia, called it – EcuiVolleyball. There are three players to each side, the net is very high, there are very relaxed rules on “holding” the ball, there’s no spiking, and people seemed to have huge fun with crowds gathering along the fence and in the stands for these specially built courts, in order to watch the action from one group of players after another. Valentina told me she has seen other courts even in New York City, but it was news to me, and wonderful to witness!